“Food” & Garden ’15? It’s Time to Eat! The Smokehouse! | It's "All in WDW"
“Food” & Garden ’15? It’s Time to Eat! The Smokehouse! Finally! I can’t tell you the number of times I’ve been asked about it, but, yes, they are here! My friends, the 2015 Epcot International “Food” (er, Flower) & Garden Festival menus are out! Yay! Geez, Disney, what gives? Tweaking some recipes, perhaps? It took you FOREVER! OK, as always, I’m focused less on “Food” & Garden’s desserts and beverages and more on its entrees. After all, they are the “meat and potatoes” of the festival! And, speaking of “meat”, let’s start with, in my opinion, the best Outdoor Kitchen of the bunch and one of its new dishes. I’m speaking, of course, of The Smokehouse: Barbecue and Brews and its redesigned beef brisket. Folks, here’s where we find those aforementioned “meat and potatoes” … in a dish of Beef Brisket Burnt Ends Hash served with white cheddar fondue and pickled jalapenos. Sounds very intriguing, and it reminds me of an item that was served at last year’s Epcot International Food & Wine Festival. 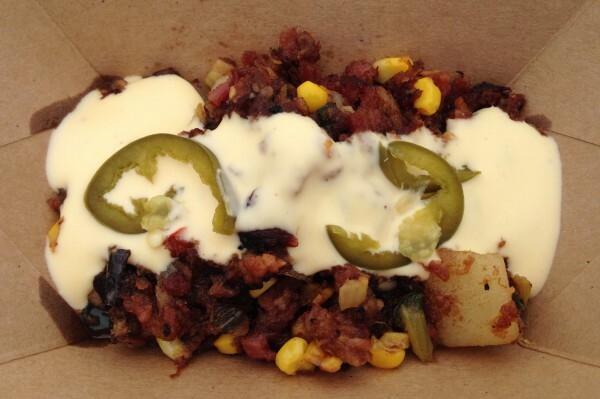 Meet Nueske’s Pepper Bacon Hash. See? It was phenomenal! Can The Smokehouse match it? I hope so. Of course, The Smokehouse has a lot more to offer than a plate of hash. How about Smoked Debreziner Sausage? Huh? Pardon my inquiring mind, but … Debreziner? Thank you, Wikipedia! Sounds intriguing, as well, by the way! I can’t wait to try this item! 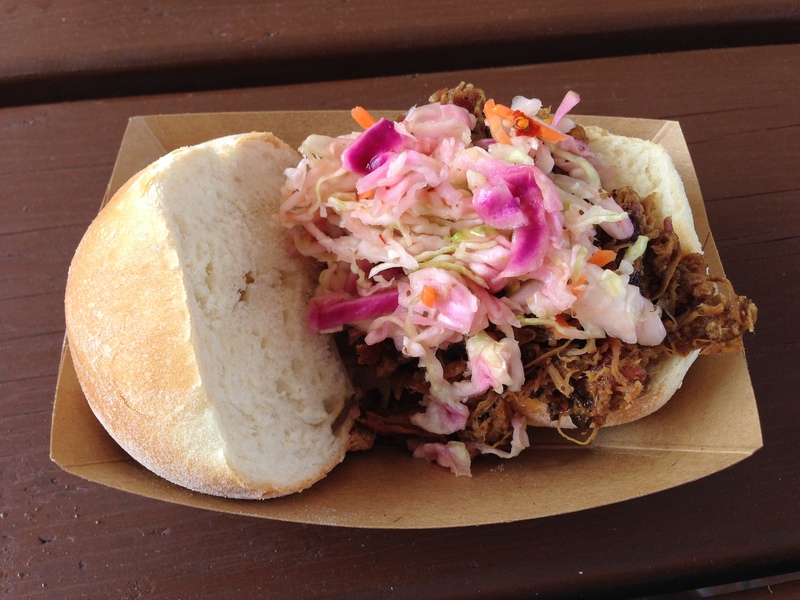 Finally, when it comes to “entrees”, we come to this festival’s “crown jewel” … a Pulled Pig Slider with cole slaw. Sounds simple, eh? You’d think that some pulled pork topped with slaw and piled on an ordinary bun would be a “ho-hum” run-of-the-mill type dish. My friends, take my word for it … whether plain (as pictured), or smothered in BBQ sauce, this over-sized slider is “top notch”! Hey! It has “won” this festival for me two years running! Each festival – whether Food & Wine or “Food” & Garden – I select the list of items that I want to sample. I build my menu, as it were. Then, to have a bit more fun with the dishes, I rank that list. For “Food” & Garden, I sort them from 1 to 15. And, that becomes my pre-festival Top 15. In early March, Mrs. All in WDW and I will pop down to Orlando to attend this Spring’s “feast”. We’ll dine on our fifteen chosen delights, and let you know how they taste. Better yet, we’ll post you pictures of their “delicious-ness”! Finally, when we return home, we’ll painstakingly re-rank them into our Final Top 15 recommendations for those fans lucky enough to attend this year’s festivities! Stay tuned over the next few weeks, folks. Lotsa food comin’ our way! Yum! Oh! I almost forgot! Let’s start building that menu! Of The Smokehouse’s “terrific trio”, how do they “kick off” my Top 15? Here ya’ go! What do you think? Would you pick the same order? Let me know! What an awesome idea to make a top 15 list! I am also heading to WDW soon and I think I might make a list so that I don’t miss anything I want to try! The weekend after Opening Day. That hash from last year looks so good! I can’t wait to see what this year’s dish looks like!